Welcome to the luxurious super yacht “PAULA III” — Mondomarine 120 berthed in the Marina Ibiza. 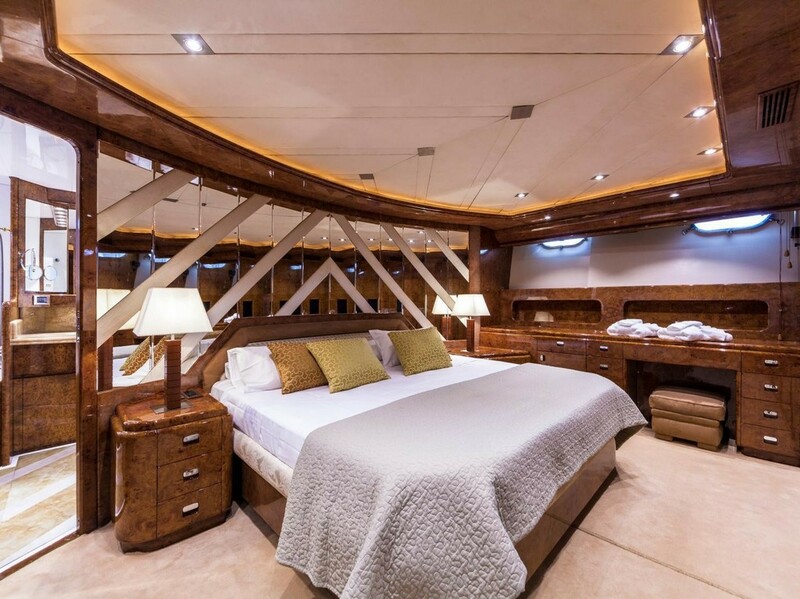 The yacht was built in 1997 and has received the last expensive refit in 2017. 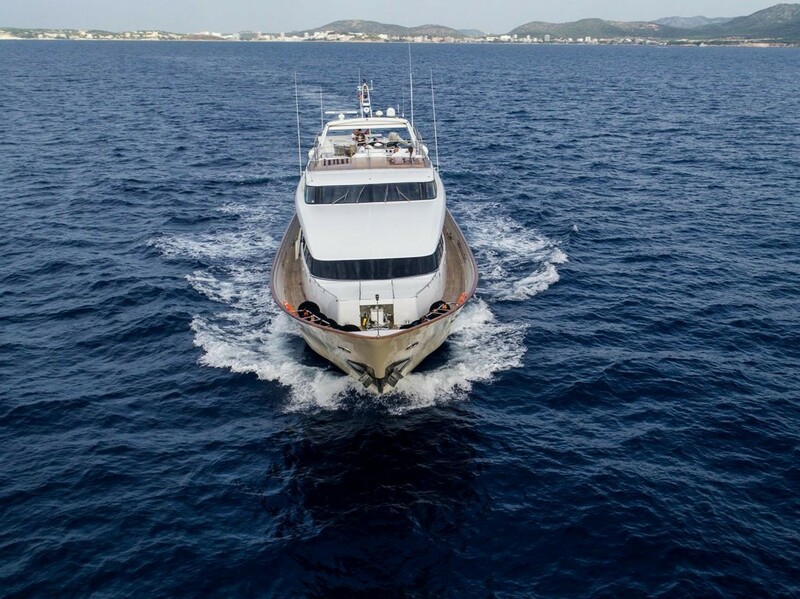 With a total length of 36.50 meters, the “PAULA III” in Ibiza offers space for twelve guests in five cabins, each with bad en suite. 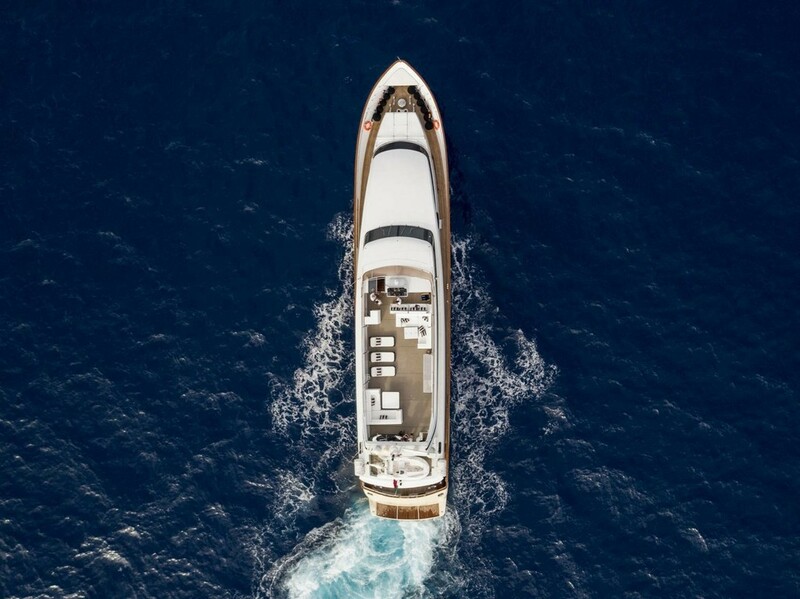 With a day charter, up to twelve guests can enjoy the day on board. 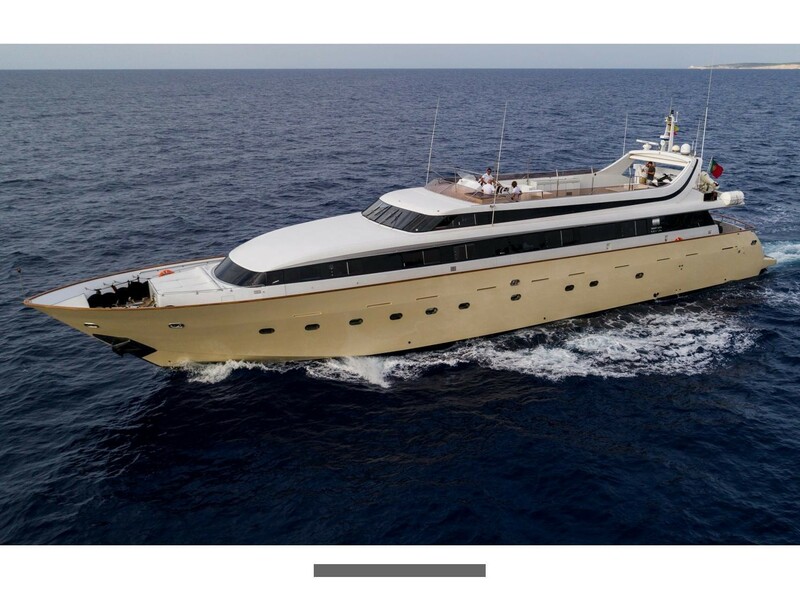 This yacht is perfect for a yacht holiday in the Balearic Islands with family and friends. 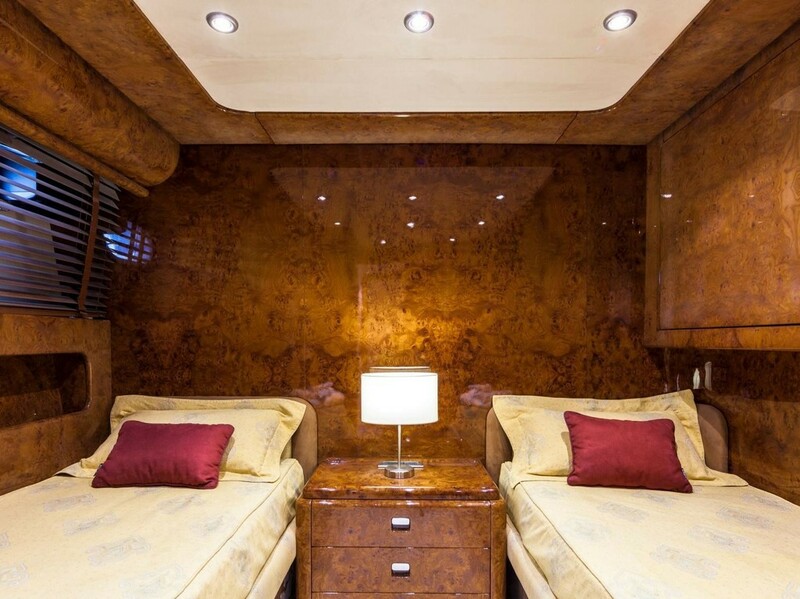 For a relaxing holiday, up to six crew members are available for the pleasant stay on board. The “PAULA III” is despite its age and its size a very beautiful motor yacht and offers a good performance. 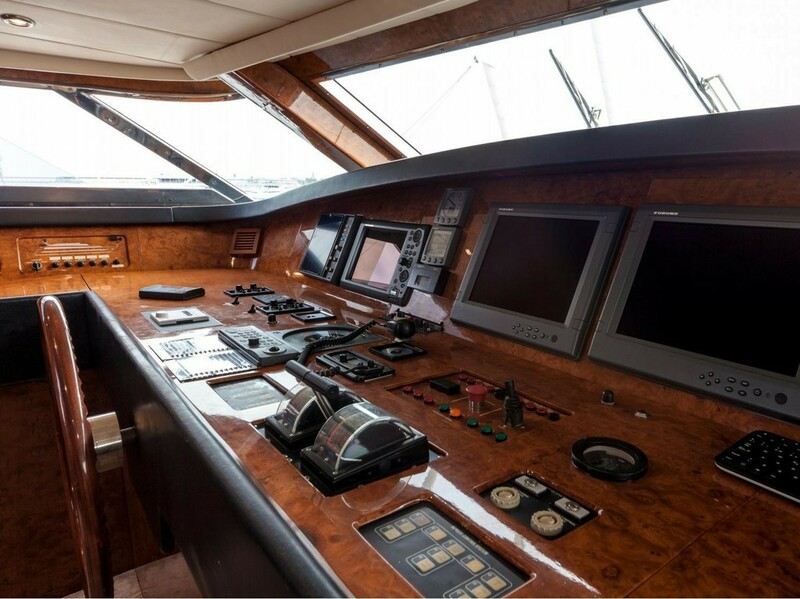 The cruising speed is 15 knots and the maximum speed is 28 knots. The two MTU engines generate a total of 4,570 hp, making it possible to cross even longer distances comfortably and, above all, quickly. 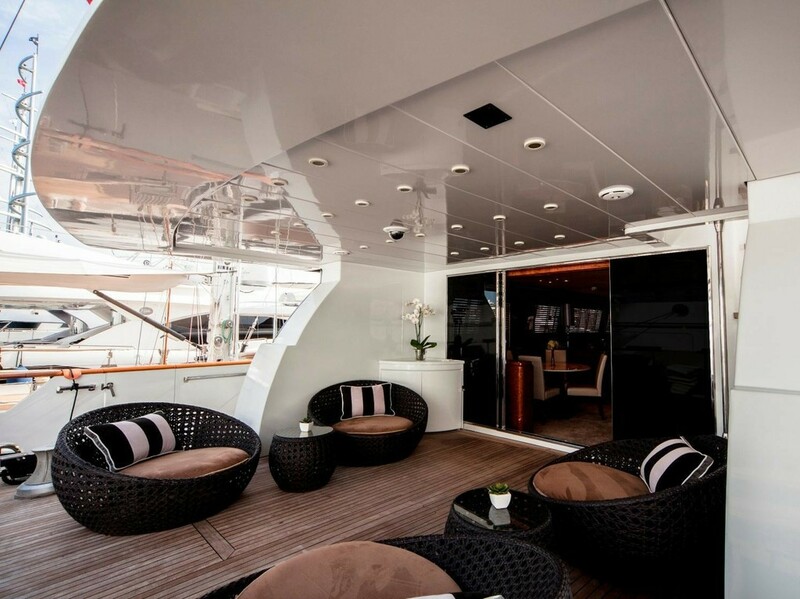 The spacious deck area of the “PAULA III” — Mondomarine 120 on Ibiza offers a lot of variety for nice days on board. 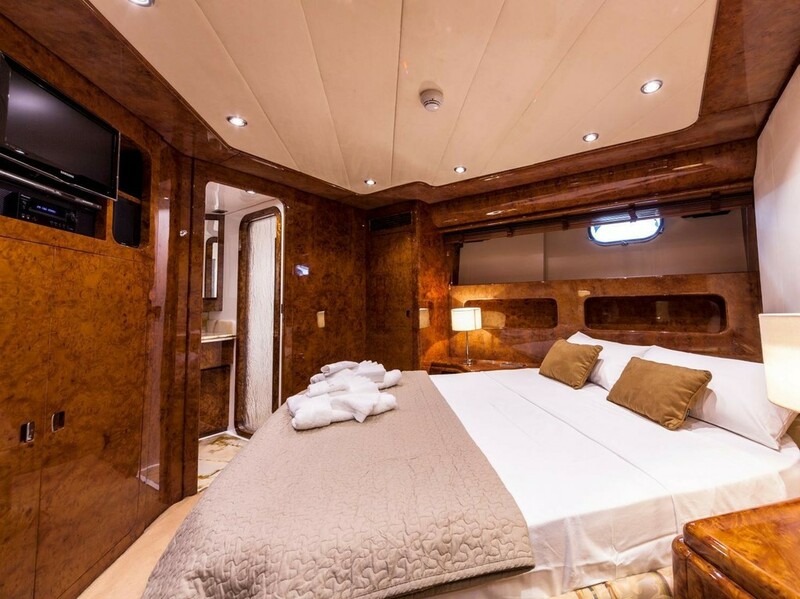 The nice atmosphere makes the stay on board unforgettable. 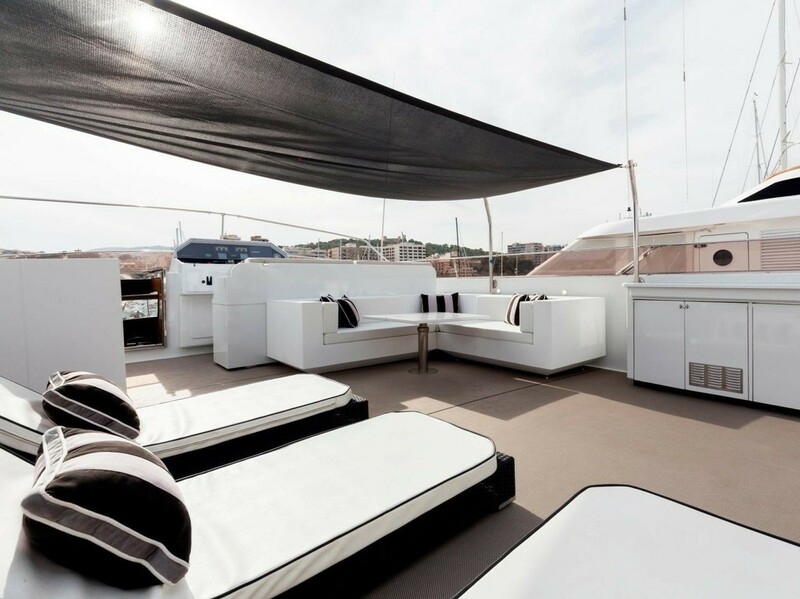 On the foredeck and on the flybridge there are comfortable sun pads for sunbathing and sitting. 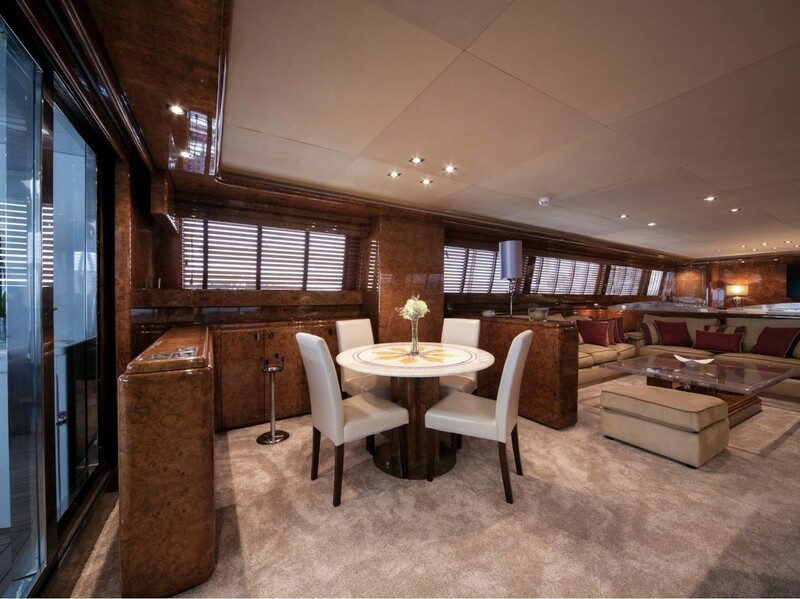 Furthermore, the flybridge next to the helm station offers storage space for the dinghy and a jet ski. Highlights on the deck include the jacuzzi, the BBQ and the outside bar. Here you can spend a wonderful day and be pampered. 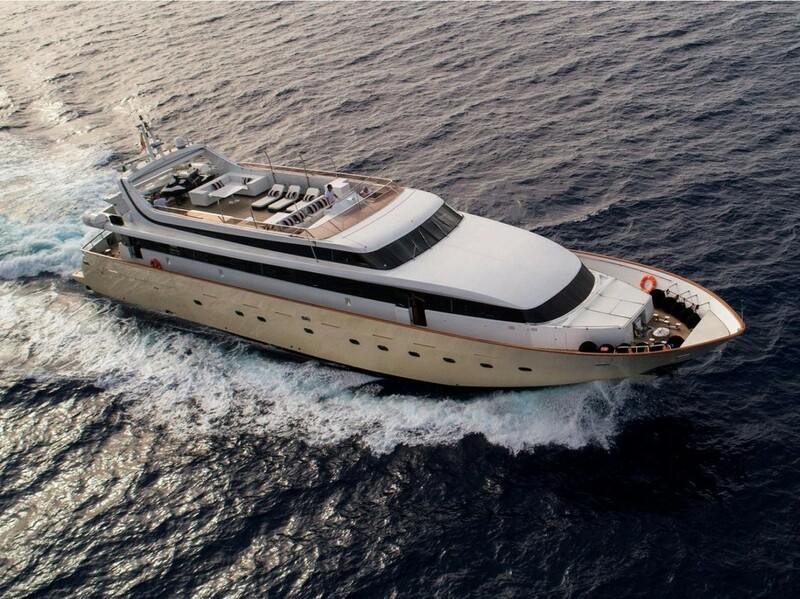 Due to the large Bimini you can enjoy the yacht holiday on deck even on very hot days. 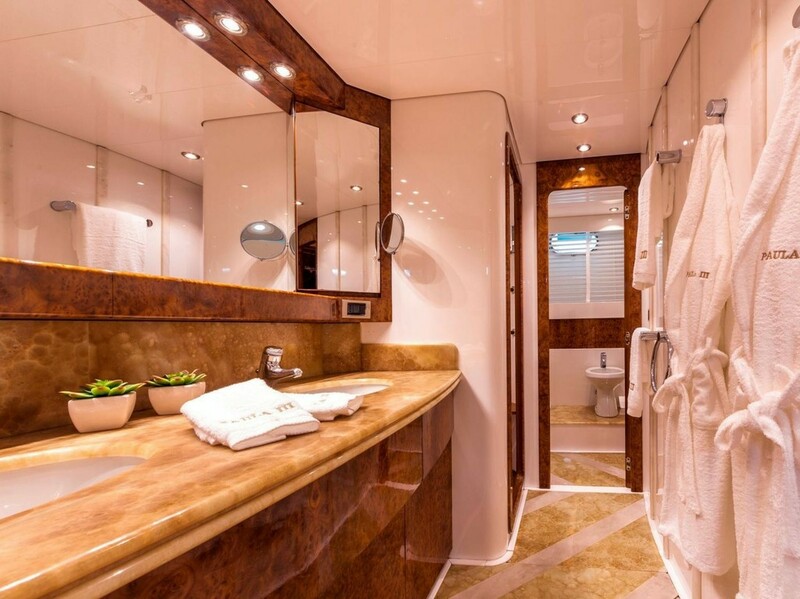 At the stern of the yacht there is a large bathing platform, from where you can get access in crystal-clear water. 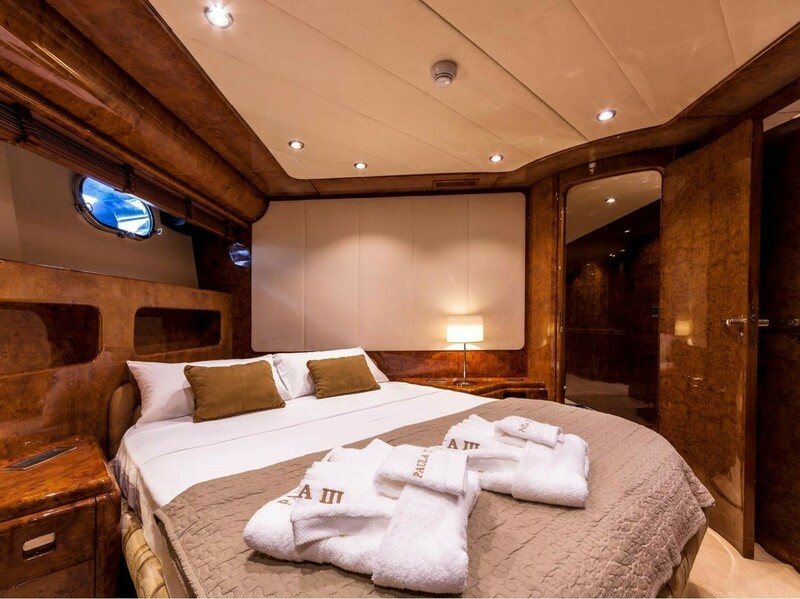 The interior of the “PAULA III” in Ibiza offers classic design and comfortable furniture for a wonderful yacht holiday. 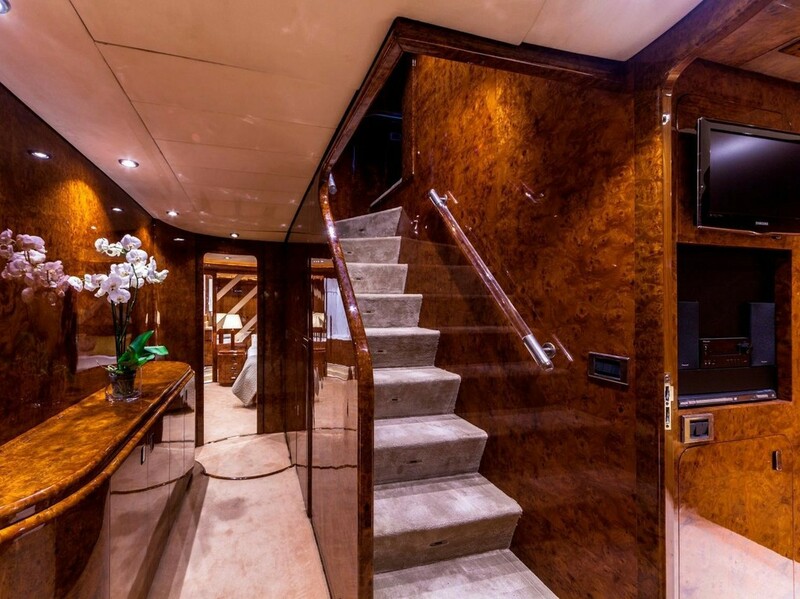 The motor yacht has five cabins. 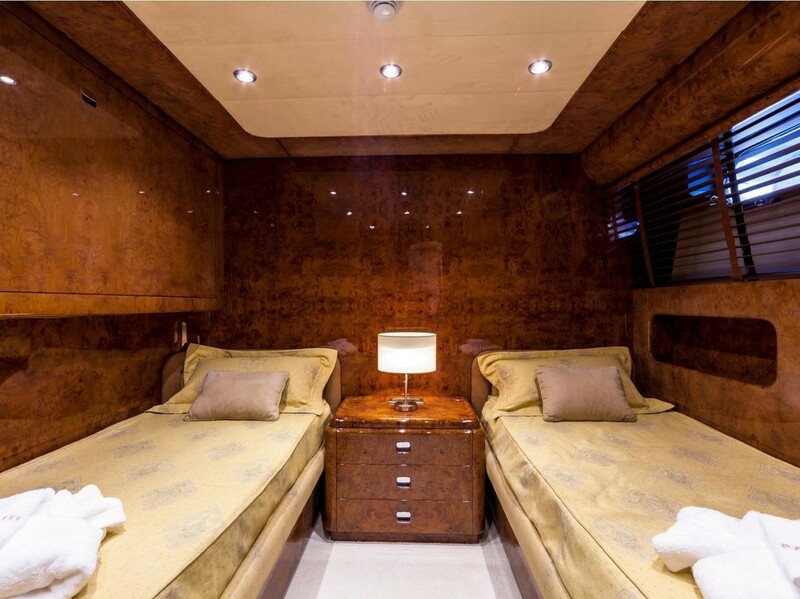 The master, two VIP and two double cabins each have en suite bathrooms and are very spacious and comfortable. Here are no wishes left. 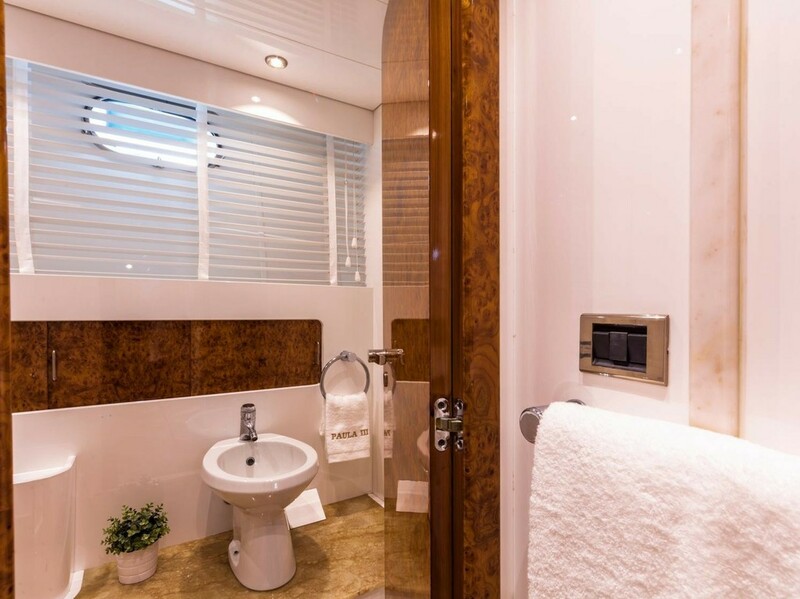 The bathrooms have showers, vanities and toilets. The salon offers a large table for all twelve guests and numerous sofas. 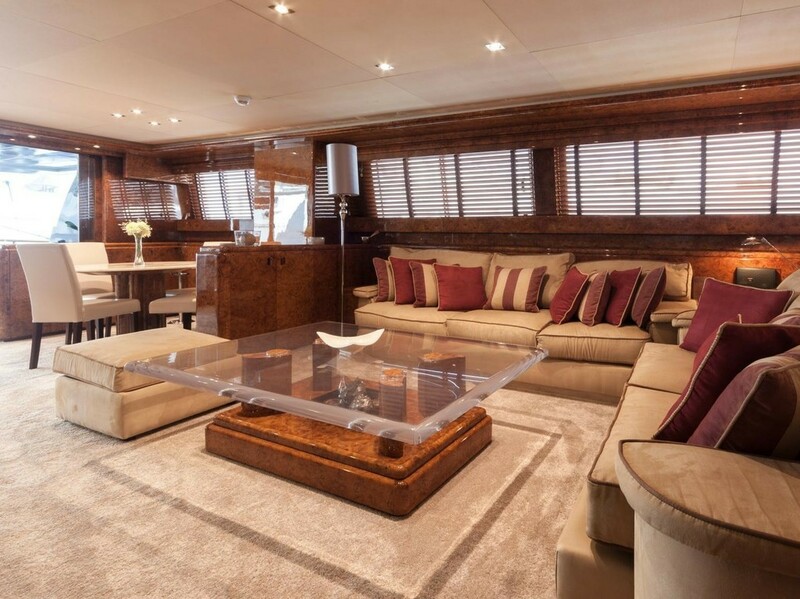 A large glass sliding door leads to the aft deck. 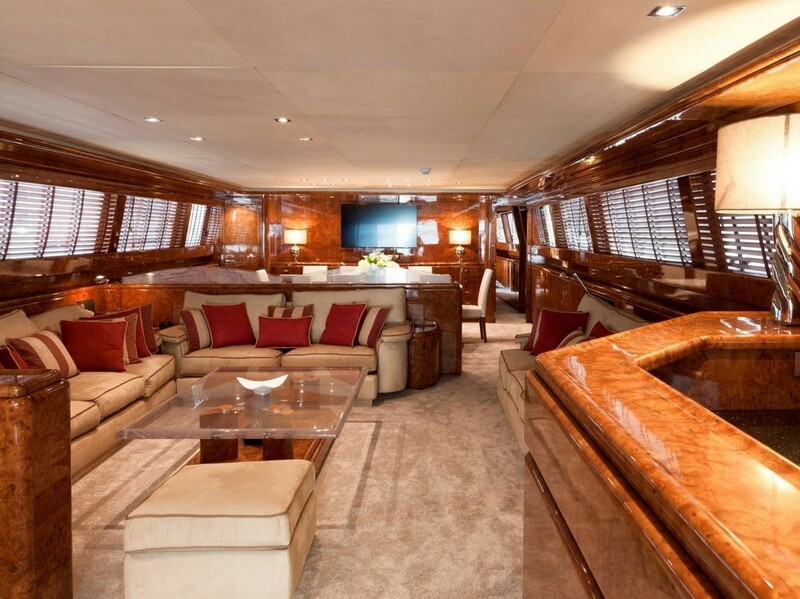 For entertainment on board, the “PAULA III” has a TV with video and audio system. Also, Wi-Fi is available on board. The lighting was completely converted to LED at the refit. The kitchen on board is well-equipped. 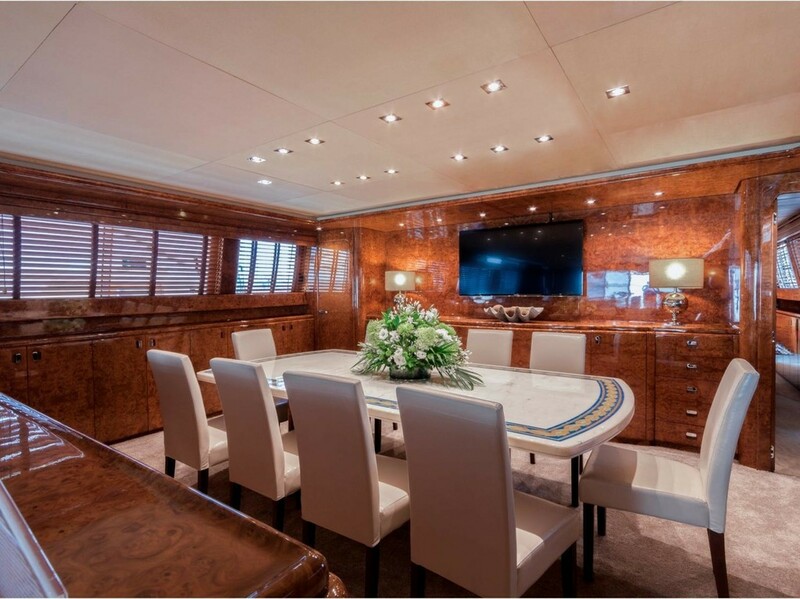 For water sports and activities on this great super yacht everything is possible. The “PAULA III” features a Zar ZF3 tender, a Spark Watercraft jet ski, wakeboard, donut, banana, two SUP boards, and snorkeling equipment.